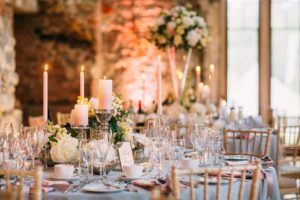 Be inspired as the most exclusive wedding venue in Dorset opens its doors for a unique afternoon showcase on Sunday 24th February 2019. Join us for a wonderful afternoon of supplier ideas and inspiration. See the castle dressed to impress and be amazed as the light falls and the candles shine out. Our caterers will be on hand with scrumptious canapes and a cold glass of prosecco. We’ll end the evening with a spectacular firework display courtesy of our friends at Fireworks Solutions. We hope that you can join us for the afternoon. Numbers are limited and entry is by guest list only, so please RSVP to weddings@lulworth.com.